Having one fixed IT technical support services is a norm among small and medium enterprises. But it’s also important to consider a backup plan when price surges and a new technology is being offered in a different IT technical support services provider. We are here to least prepare you for your new IT Technical Support Services Provider when the time comes. In case there are changes in your technical requirements or pricing, you should have enough options when choosing a new IT Technical Support Services Provider. It is a good practice to try out other companies that can best fit your interests and technical requirements. How much do you pay to your IT Technical Support Services in New Orleans? The level of service gives you an idea of pricing. If you’re paying for triple the amount of service fee to your current IT support services provider while you can get a value-based pricing model from another IT Support, you might want to reconsider your budget now. 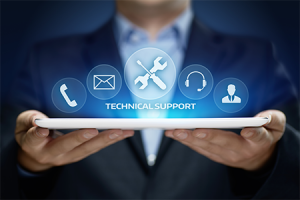 What levels of support plan your IT Technical Support Services offer? a) Can I afford to pay for break-fix types of issues only? b) Can I hire the IT Technical Support Services Provider for an hourly rate on an as needed basis in New Orleans? c) Do they offer full IT Technical Support Services contracts in New Orleans? Read your contracts carefully before investing with a new IT Technical Support Services Provider. Do they state how many visits do they cover? Do they include gadget and network troubleshooting? Think carefully if a customized plan or a value-based pricing model. Ask the new IT Technical Support Services if they can guide you with the available choices and discuss your limitations as well. Transparency is also important for an effective collaboration. Change can be uncomfortable but it’s still worth the try. Your IT Technical Support Services Provider should be a trusted extension of your business. It takes time to build and prove that trust. It’s advisable to sing for short-term agreement first before signing up for long-term contracts to save you from a bigger inconvenience in the future. Does the contract include insurance? Communicate with your new IT Technical Support Services Provider if you are insured when things go horribly wrong. Always remember that the right company will promise and guarantee a first response time. They will make an effort to notify you that they are aware of the issue and actively working on it. Use caution for companies that guarantee that issues will be resolved within a specific amount of time; as this is something that no one should claim. What if they promised to resolve the issue for just an hour but took two hours and charged you for the succeeding hours? Certain issues take time to discover the problem and anyone that claims otherwise raises a red flag in terms of trust. Do they support a 24/7 customer service? When can you contact them when your system crashes? Make sure the IT Technical Support Services Provider you choose provides the level of service your business needs. Over the 5 years, what is their customer retention rate? Customer satisfaction and retention are important. If their clients have been renewing their contracts every year or every five years with them, take that as a good sign. ThinkIT Solutions is always here to listen to your queries at any time. Change, itself, is already uncomfortable because many IT Technical Support Services Providers promise a handful of services that may not work for you. Communication is the key to each partnership. You may ask us the following questions and we are pleased to provide you answers.